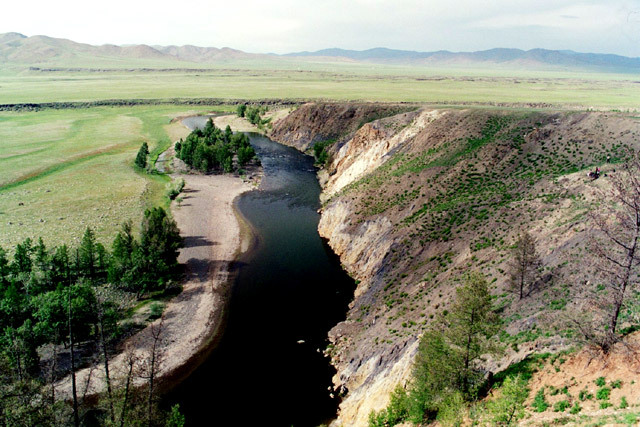 Start Camp on river south of Tsenkher N47º19.220' E101º47.549' 1,651 meters . Kharkhorin . . . .
- Erdene Zuu Khiid monastery . . . .
- Shankh Khiid monastery . . . .
Khujirt . . . .
Khangai Nuruu National Park . . . . Weather: Begins mostly clear, sunny and warm. In the afternoon, overcast, cool and very windy. The evening is partly cloudy occasional sun, very windy and cool. Cold overnight. Another relaxing start to the day - we are really getting used to this. We are up at 8:30 AM and pack up our tent and get our basic breakfast of bread, salami and cheese, and peanut butter and nutella ready. While Lars is collecting water from the river, a mother duck reacts with alarm and shrilly calls out to her brood of 6-7 ducklings to gather around her and flee down the river. She seemed very surprised to see us there. We head off shortly before 10 AM and make our way back to the dirt tracks that pass nearby. 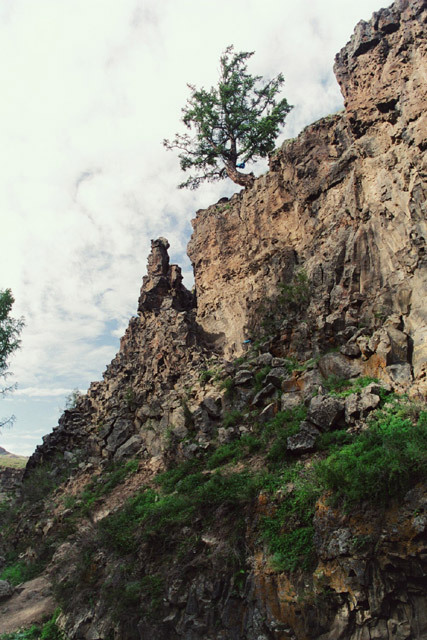 We drive along the steppes and soon are missing the trees that had lined the river where we camped for the night. At around 10:20 AM we pass through a hamlet that is not marked on our map, but it is a dreary place. Looks like it may have been an old Soviet collective, where the nomads were forced to live. Very rundown and there are these prison like buildings that may have been housing assigned to them. They are now abandoned and people are living in fenced in homes with gers in the yards. 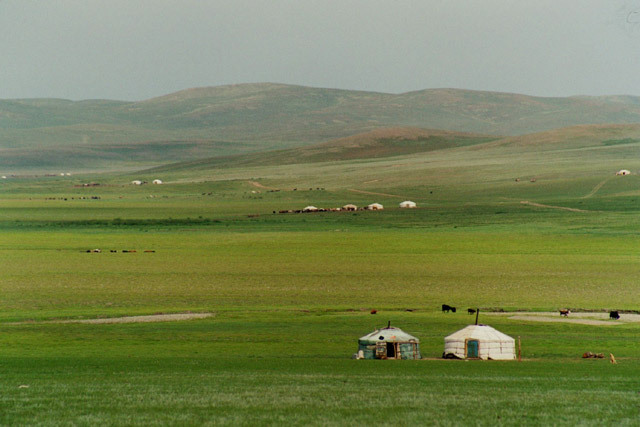 About an hour later, we bypass the town of Khotont and carry along on the steppes. We pass a number of gers along the way and quite a few of them have some form of renewable power, such as a solar panel or a wind turbine. There are also a few that have satellite dishes pointing up at the skies, ready to bring all sorts of nonsense into their homes. 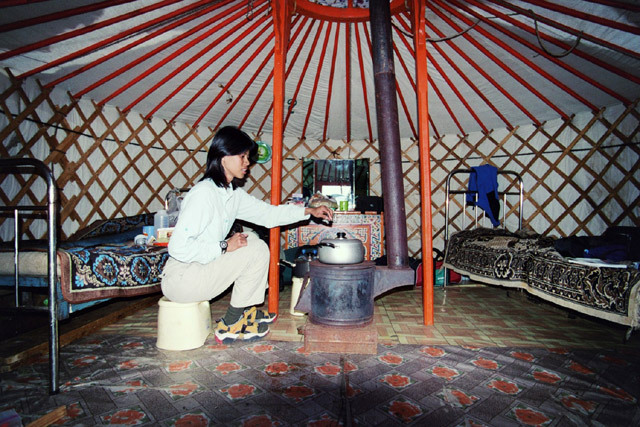 Just after noon, we arrive in Kharkhorin (also known as Karakorum). 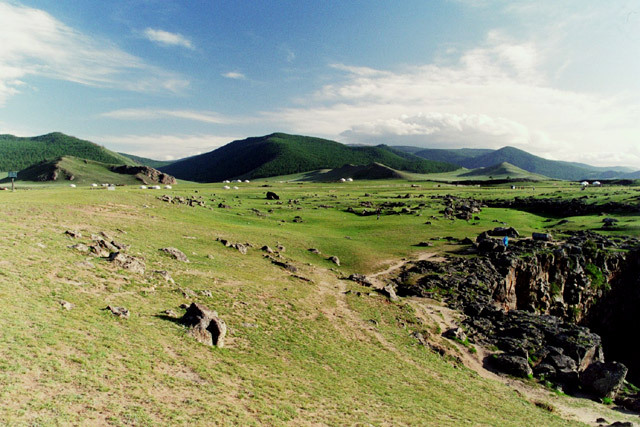 In 1220 Chinggis Khaan decided to move his capital here, but building only began after his death under the rule of his son. 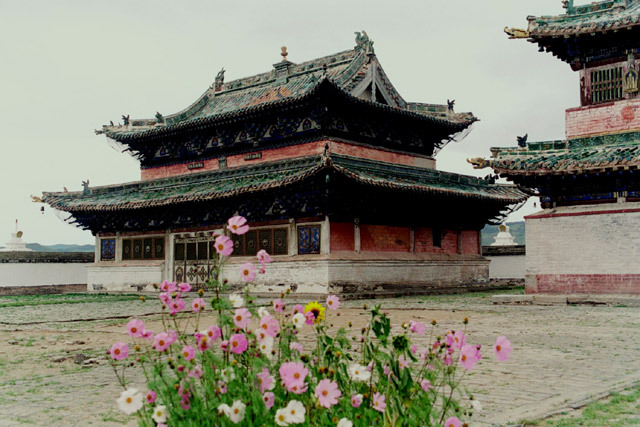 What was left of the capital, was destroyed in 1338 by vengeful Manchurian soldiers and the remains of the city was eventually used to help build the important monastery of Erdene Zuu Khiid in the 16th century (the first Buddhist monastery in Mongolia). And that, or rather the remains after the Stalinist purges of the 1930's, is what we are here to see. Gerlee takes us to the far end of complex, where the points us in the direction of the turtle rocks. 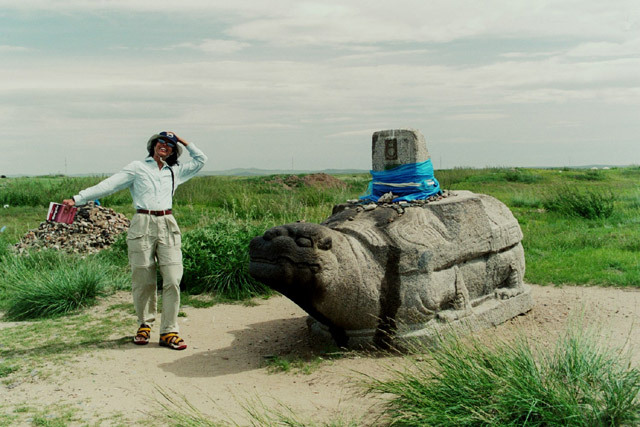 Four of these sculptures of turtles were used to mark the outer boundaries of the ancient capital (turtles being the symbol of eternity). Two are remaining, and we went to go see the easy one to find. The other one appears to be under excavation. 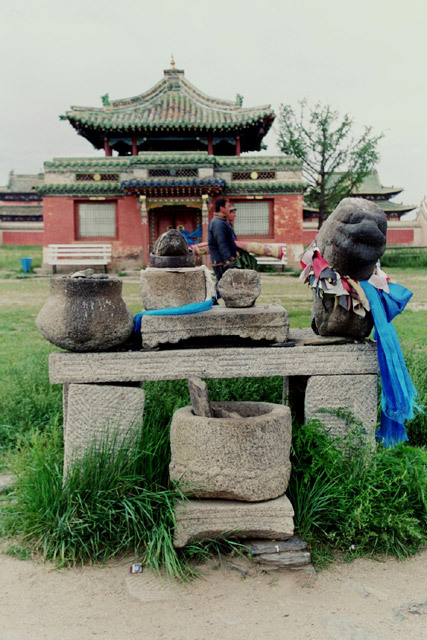 It is a simple sculpture, but it is amazing to think this dates back to Chinggis Khaan's era. There are a circle of souvenir vendors that have set up shop on tables half surrounding the turtle. There must be some requirement that they stay a certain distance away, but they still intrude on the place. 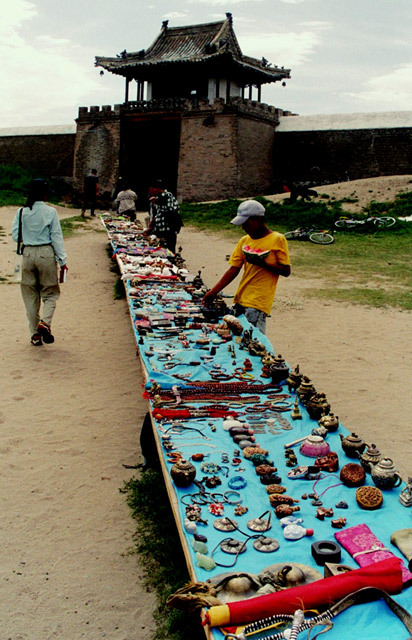 We then walk the short distance to the northern gate of the monastery complex, being greeted on our arrival by another row of souvenir stands selling all sorts of stuff, ranging from small stone turtles to Buddha icons to old junk. 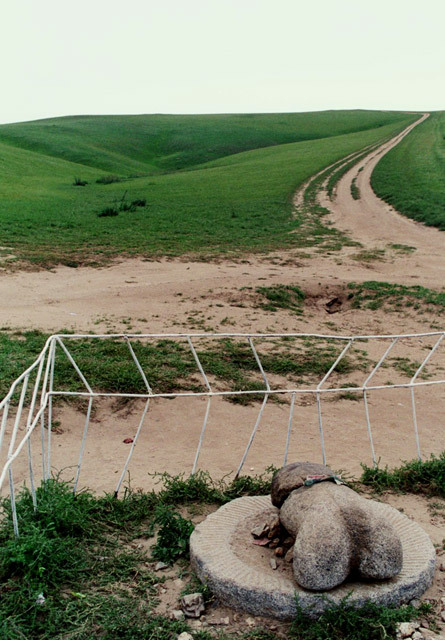 We enter through the massive gate with some struggle due to the strong winds that are blowing along the flat steppes. We are glad to gain some shelter from the gusting wind behind the walls of the ruined monastery. 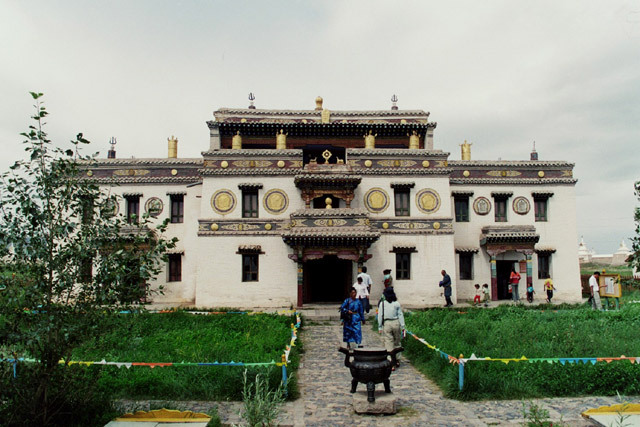 At it's peak, the monastery had between 60 and 100 temples, about 300 gers were set up inside the walls and over 1,000 monks were in residence. The temples have been damaged at various times throughout history, but the worst was in the 1930's under the Stalin purges. 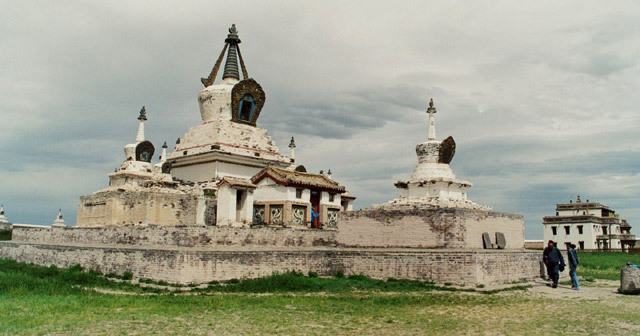 All but three of the temples were destroyed and an unknown number of monks were either killed or sent off to exile in Siberia. We went and visited all three temples in turn, some which are in operation today. The first one, as we walked in from the north is the Tibetan style, white temple of Lavrin Sum. Ceremonies were taking place inside as we walked around. Next is the Golden Prayer Stupa built in 1799, along with a small building next to it, which is supposed to have been the first temple built here. 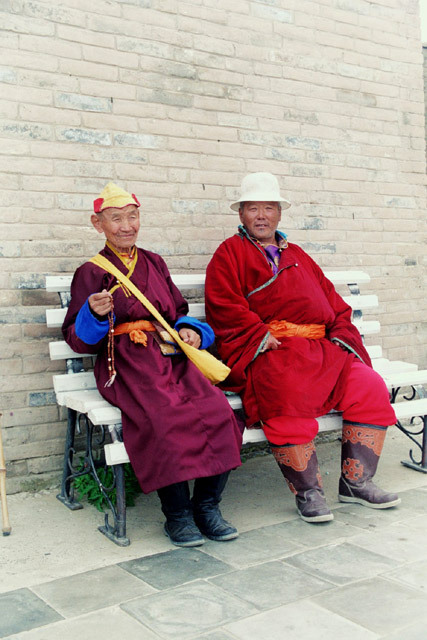 Finally, we take a look at the temple of Dalai Lama Sum, which was built in 1675 to commemorate the visit by Abtai Khaan's son, Altan, to the Dalai Lama in Tibet. Before leaving, we pay a visit to a large ger, which turns out to be the center for the reconstruction of one of the other main temples. We made a small donation. We went out the south gate to double check that Gerlee had not driven over there (he had not) and then headed back through the gate (noting the old men sitting around under the gate) and the temple complex to exit from the north gate. Back in the gusting wind, we walked back to our jeep and headed off for a quick lunch in a local place. Then, before we head out of town, we try to find some petrol, but no luck. A short way out of town, we drive off the main road to go visit the somewhat bizarre phallic rock. The rock was carved into a very realistic phallic symbol and placed facing what is called the vaginal slope. Local legend states that the rock was placed here in an attempt to stop randy monks from fraternising with the local women. After about a 30 minute drive we arrive at the Shankh Khiid monastery. 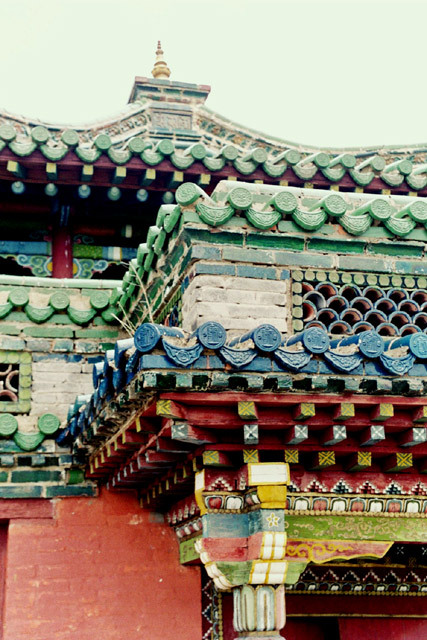 It is one of the only other few monasteries to survive the Communists. But there is not much for us to see. The building is closed and it is a small temple. We drive on and it takes us almost an hour to get to Khujirt (a relatively large, but miserable, town with numerous old factories in varying state of collapse), where we make a slight detour into the town in search of petrol. We are able to find some at a reasonable price. It is interesting to watch some of the locals ride up on horses and collect small amounts of petrol in bottles, strap it to their horse, and then ride off again. From here, we carry on to towards the national park that is our goal for the day. Along the way, we stop at a gorge that the water has carved out in an L shaped bend of the river. We enter the Khangai Nuruu National Park at around 6 PM. The entrance to the park is at the start of a long valley. We will be heading up the "V" shaped, broad, flat valley to the very end. The only problem is that the valley is interspersed with walls of lava rocks, that make the going very slow and bumpy. The track has to wind it's way in between the rocks, or where need to, over the sharp stones. We finally make it to the waterfall of Orkon Khürkhree just after 7 PM. Now we need to decide where to spend the night - in a ger or a tent. Well, given the strong wind rushing down the valley and the altitude, we decide to take the small ger that they have offered to us. We are glad to see that they even put in a wood fired stove for us. We unload our stuff and as the sun is now shining, we decide to wander over to see the waterfalls for which the area is famous. We spend about an hour exploring around the falls. 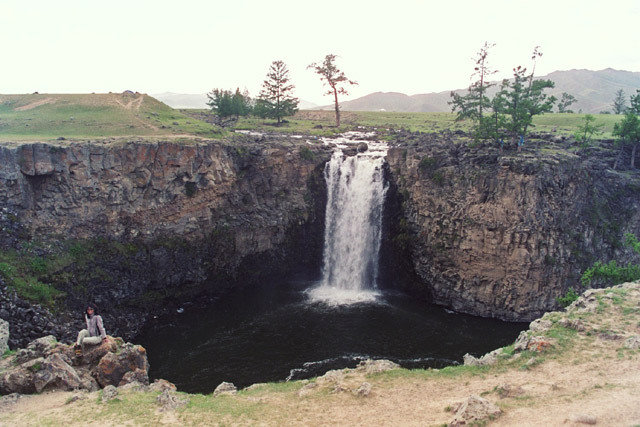 They are not big falls, by any measure, but they are nice. The sun is setting behind the falls, so while we have a nice view of them this evening, we decide that it would also be good to come back in the morning. It is possible to clamber down to the bottom of the gorge to see the falls from the bottom. It is a steep climb and we are on all fours, but it is worth it. The gorge is very pretty, filled with pine trees and very scenic. We sit for some time at the bottom of the falls and then head back up to the ger camp. Back at the ger, it appears that they have been waiting for us - to slaughter a sheep. They ask us if we would like to watch, and we politely decline. Instead, we go and prepare our own simple meal of curry and rice. As we are cooking our dinner in our ger, we take the time to go out and watch a beautiful sunset. They give us a bowl of mare's milk yogurt, which we sample with our dinner. In the end, we make a mixture of the yogurt, some sugar and the berry jam that is delicious.